Pope Francis is to visit Knock in Co Mayo when he travels to Ireland in August for his first visit as pope. The announcement was made by the Vatican this morning in a statement outlining his itinerary, which spans the weekend of 25 and 26 August. The main purpose of his visit is to attend the Catholic World Meeting of Families in Dublin's Croke Park and to celebrate the closing mass of the gathering at the capital's Phoenix Park. The Dublin venues were already well flagged by the WMOF's host, Dublin's Archbishop Diarmuid Martin. 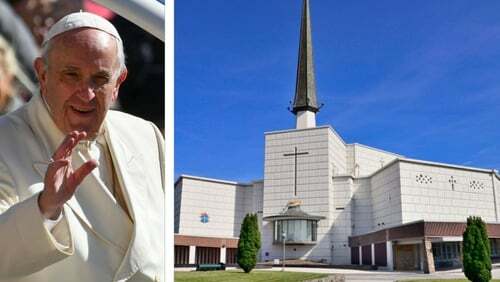 But the pope's decision to publicly recite the Angelus prayer at Knock's main Marian Shrine, while strongly rumoured, has only now been confirmed. The basilica of Our Lady, which has recently undergone a multi-million euro makeover, was the principal destination of St Pope John Paul II when he paid the first papal visit to Ireland in 1979. The pontiff will be welcomed by President Michael D Higgins at Áras an Uachtaráin when he arrives in Ireland. He will also visit Dublin Castle and the Pro-Cathedral, before a private visit to the Capuchin Day Centre for Homeless Families. He is expected at Croke Park at 7.30pm where the WMOF is being held. On Sunday 26 August, Pope Francis will travel by plane to Knock for the short visit there before returning to Dublin where he will celebrate mass in the Phoenix Park at 3pm. The itinerary was simultaneously released in Rome today and Cardinal Kevin Farrell, Prefect of the Dicastery for Laity, Family and Life, told RTÉ News that everybody is welcome to attend the gathering. He said: "Everybody is welcome to attend the gathering of the families, and the church is always open and always has its arms wide open. "Perhaps in the past it was not like that, perhaps we still need a change in many parts to accept people for who they are and what they are." Archbishop Martin said the pope's visit will cost €20m and the Office of Public Works said the capacity of Knock Shrine would be capped at 45,000 people. The State will pay the cost of security and other logistical costs during the pope's visit. The arrangements will be similar to that of a visiting Head of State. The church will pay the remainder and €5m has already been raised in collections. Taoiseach Leo Varadkar described the visit as "significant" and a "hugely important opportunity to showcase Ireland as images of this visit will be viewed around the globe". Leader of the Catholic Church in Ireland, Archbishop Eamon Martin, said there will be a lot of disappointment and sadness that the pope will not be visiting Northern Ireland. However, Archbishop Martin said he expected thousands of people to come south to see him in Knock and the Phoenix Park. Knock Parish Priest Fr Richard Gibbons said that while he only received official confirmation today that the pope would be visiting, he has been liaising with Rome for a number of weeks. Speaking on RTÉ's Today with Sean O'Rourke, he said he believed Pope Francis wanted to visit Knock and that he has a great devotion to Our Lady and St Joseph. Fr Gibbons said the pontiff would spend around an hour at the shrine where he will greet the public before having some private time for prayer ahead of reciting the Angelus outside the shrine. Those wishing to attend the all-ticket events must register on the World Meeting of Families website. Historian Catherine Corless, whose research led to the discovery of infant remains at a former Mother and Baby Home in Co Galway, has said she hopes Pope Francis will acknowledge the failings of the church during his visit. The visit to the Marian Shrine will bring him to the Catholic Archdiocese of Tuam, where the Bon Secours Order ran the home for several decades. Following research by Mrs Corless, it was confirmed that "significant quantities" of human remains were buried in the grounds of the home. A consultation process on how best to proceed with the investigation was completed earlier this year and the Department of Children is expected to indicate whether a partial or full exhumation of remains will take place. Speaking today, Mrs Corless said survivors and their families were hoping that the pope would make reference to what happened in Tuam during his visit to the area. She called on him to be mindful of the all survivors, as well as the hundreds of babies that were buried at the home. The historian has written to the Vatican seeking a public acknowledgement of the role the church played in the lives of the mothers and infants in question. She said that if the pope was to accept the wrongdoings of the past "it would turn the country around", as it would mean so much to so many people.